There are plenty of places to work out, but why not choose something fresh, effective, and most of all, fun? Thanks to a dedicated staff and tailored fitness regiments, JB Dance Studio will increase your commitment to staying healthy. It’s fitting that JB is located in Vegas’s newly improved The Boulevard, because those are the most common results from working out at the dance studio: new and improved. JB Dance Studio operates under a holistic approach to fitness and health. Instead of mundane workouts, the trainers provide customized wellness coaching, nutritional guidance, and personal training. Trainers customize your workouts with a complimentary fitness assessment, followed by a fitness plan based on your goals, fitness level, activity level, and exercise knowledge. As you progress, you will enhance your strengths and minimize your weaknesses. Classes include Zumba, sports training, and children’s classes. The studio also provides individual saunas. JB’s dance instructors are highly knowledgeable in jazz, hip hop, break dance, valley dance, and much more. No matter what age you are (there are classes for as young as 3 years old), there is something for everyone. JB also offers plenty of dance (and fitness) apparel and top of the line products to make your workouts smoother. JB Dance Studio is more than just a place to work out. It’s a positive platform in the community. 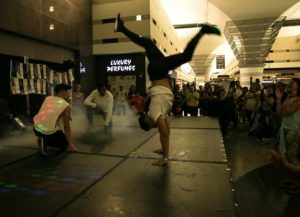 Besides motivating people to be happy and healthy, they also hosted several events, like the Zumbathon for the victims in the Pulse Orlando attack, and the Ultimate Dance Experience with The Brutez. If you’re looking to feel stronger, more confident, or just looking to tweak those dance moves you’ve been working on, check out JB Dance Studio at the Boulevard.